...sitting in the sand? 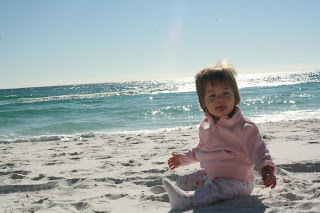 We drove 10 hours across 5 states to spend Thanksgiving on Florida's Emerald Coast with our family who drove down from Iowa. 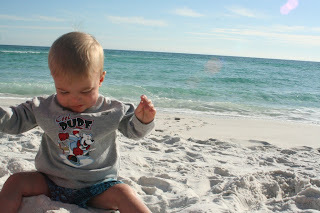 The sand is so white you would think it is snow, especially with the breezy temperatures we're experiencing around here! We have so much to be thankful for this year; two beach vacations, a couple of mom-and-dad-only vacations (thank the Lord for grandparents! ), bountiful provision of all the food our family of 6 inhales, but most of all for four very healthy babies and two sturdy parents who haven't quite yet gone insane. Looks like a great time. 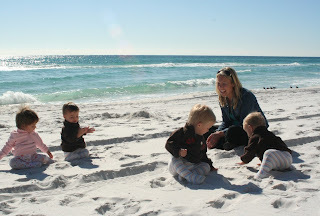 So beautiful...the sand and your family. 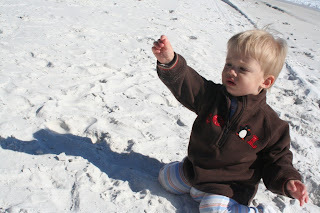 We'll second that-we are loving the beach. Off to go again before the weather changes. 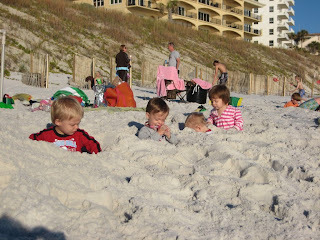 The kiddos look like they are enjoying your beach just as much. Happy Thanksgiving-much love! right on - looks like a great family holiday! We're thankful for great friends like y'all. Can't wait to get the fams together in the future. Enjoy the trip and safe travels! What pretty and precious smiles from the kiddos. Glad this Thanksgiving was GRAND!!! Looks like a great time. The kids look like they enjoyed it. I hope your Thanksgiving was blessed because you deserve all God's blessings. Awesome Thanksgiving get-away! Hope it didn't take you too long to de-sand the babies....I'm sure they had it in every possible crack and crevice. 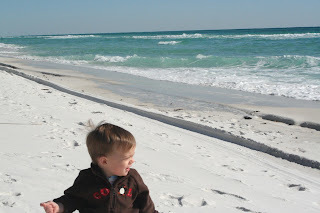 This landlocked mama gets scared everytime she thinks about so much sand! Love the "snow" pics! We'll be in Orlando for Christmas.. this looks like a perfect place for a picture!